Escápese del bullicio urbano por un día en este tour culinario de 6 horas por el campo romano. 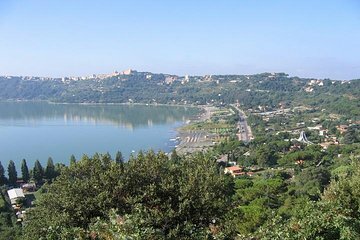 Viaje a lo largo del antiguo Appian Way a través de pueblos históricos como Castel Gandolfo, Nemi y Frascati, deteniéndose en viñedos y otros destinos gourmet para deleitarse con los sabores locales. Pruebe excelentes vinos regionales, productos especiales como "porchetta", galletas recién horneadas y helado cremoso, mientras que su guía comparte información sobre la historia y la cultura del hermoso paisaje. Recorrido de 6 horas por la gastronomía romana. Degustar vinos regionales en un viñedo. Visita la residencia de verano del papa Castelgandolfo. This tour was amazing. I went with my mom and she loved it too. The staff is great and they make you feel very special. The sites were breathtaking and good shopping too. I had an amazing time and would even consider going again if I ever get back to Roma. This tour exceeded our expectations in so many ways. First, we thought this was a small group tour...well as it turned out we were the only ones who booked that day Aug 17, 2018 so voila....private tour. Antonietta was our awesome guide along with Adam our driver. Castel Gandolfo is a pretty little town along the rim of an ancient volcanic lake. We started our day in town with a tasting in a local shop. From there we went for a pairings lunch to Ristorante Pagnanelli - one of the owners was our host....what a special treat. The was setup on their balcony overlooking the lake. Breathtaking. From here we experienced likely the best porcetta I have ever had My wife is Italian and she agreed. 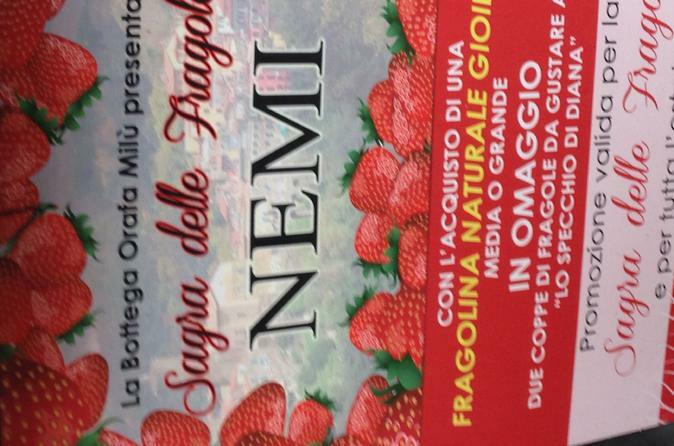 And ended the day in Nemi for an excellent strawberry treat. And for a surprise last visit we stopped at a McDonalds on the way home. I wont tell you what this was about...youll just have to experience it for yourself. We enjoyed this tour very much. Both the guide and the driver were fun to be with...and very helpful. Only set back was the weather. It was very cold and raining. Otherwise, the whole tour was great. Highly recommended. It was everything as described and our tour guide and driver were fantastic. It started raining just as we got to the vineyard so we couldn't finish the tour there. Instead our guide took us on a brief tour of Rome when we got back to the city. This was a lovely day trip, and the driver and guide were phenomenal, but the things we experienced were not those mentioned in the description of the trip. We were never offered any porchetta, popped biscuits or gelato at the places visited. On returning, I had to reread the trip summary because I started to doubt my memory of it. I think maybe there should be more honesty about what is actually offered, so the expectations will be valid. HIGHLY RECOMMENDED!!! THE VIEWS ON THIS TOUR ARE SPECTACULAR!!! It was a fantastic tour. We've been going non-stop for 10-straight days and needed to slow-down for a day. This was the perfect tour. It was a relaxing day in the countryside of Rome - away from the tourism crowds - at OUR OWN PACE. We had a great time eating wonderful food, drinking fantastic wines, and sharing great conversation overlooking Lake Albano in Castel Gandolfo where the rowing events in the Rome summer Olympics were held. The view was stunning. Then it was on to the town of Nemi for more great wine, great food, shopping, strolling, and relaxing at the sidewalk cafes. Our last stop before returning to Rome was the town of Frascati - famous for it's wine by the same name. We leisurely strolled around the town, visiting shops along the way, sampled some more food and wines, stopped for some coffee and gelato for dessert. This relaxing, wonderful day was made even better by our guide, Donald, who was outstanding. He let us enjoy the day at a leisurely pace. This was the best tour we have taken the entire vacation, and we have been touring everyday from the Vactican to the Collesum to The Isle of Capri.